Another historic year of rugby came to a close Saturday, June 4 as the Wisconsin Women’s Rugby team capped the 2015-2016 season as the USA Rugby Division 2 National Runners-Up. Undefeated in all D2 competition throughout the year, Wisconsin lost its national title match to the Life West Gladiatrix (Hayward, CA) 66-20. GLENDALE, Colo. – Life West scored 12 tries in a 66-20 defeat of reigning title-holder Wisconsin Saturday to win the USA Rugby Emirates Airline Women’s Division II National Championship in its first year in the competition. Beginning a five-match championship weekend at Infinity Park, the Gladiatrix ticked the scoreboard from the opening minute of the match to the end of the 80th, starving Wisconsin of the possession necessary to launch a proper title defense. Catherine Benson and Angelina Lomu each recorded a hat trick of tries, with Lomu scoring her first of three in the first minute of the match. Life West found several gaps in the Wisconsin defense from the opening restart and the first pass out to the wing landed in Lomu’s hands for a broken Grace Hovde tackle and 40-meter run to the try zone. Wisconsin had a few set pieces turned over by the Gladiatrix in the following minutes, and the pressure inside the team’s half of the field yielded more points for Life West. Despite a mishandled pass on the wing, prop Catherine Benson used her mobility and strength to get through the line from five meters for a 12-0 lead. Benson doubled her tally in the 10th minute after full back Cameo Motley created a gap along the gain line inside her own half. She was taken down with a high tackle within 10 meters of the try line, and Benson received the first pass from the tap for a 17-0 score. Wisconsin got on the scoreboard through Ashley Shaw but Life West replied immediately for a 22-7 lead midway through the first frame. The Gladiatrix went over the line twice in the span of five minutes, though both attempts at five points were deemed to have been held up by the match official. Continuing to dominate the set pieces, Life West kept the ball in the offensive third and fly half Megan Foster went over the line from a scrum win. Foster set up the next try – and successfully kicked the conversion – to extend the lead to 34-7 with a break inside the offensive 22. Motley took the ball over, and Pinson followed suit from five meters for a 39-7 score line. Benson rounded out the first 40 minutes with her hat trick from the final restart, 44-7. Life West had used its quick offloading and strength to create gaps and bust through defenders throughout the opening frame, and continued until the final whistle. Wisconsin refused to be ignored, scoring two tries and kicking one penalty goal, but No. 8 Jenn Sever scored a brace of tries and set up her scrum half, Lauren Kenyon, for one for a 66-20 final. Foster, the match’s Most Valuable Player, cited Life West’s ability with ball in hand as well as reading the opposition as the team’s keys to victory – in addition to the first-minute start. “I think the first try really set the tone,” the AIG Women’s Collegiate All-American said. “We just feed off of that. Every game that we’ve scored early it’s just been non-stop. We just go with each other, kept it positive out there, and when we do that we’re pretty unstoppable. 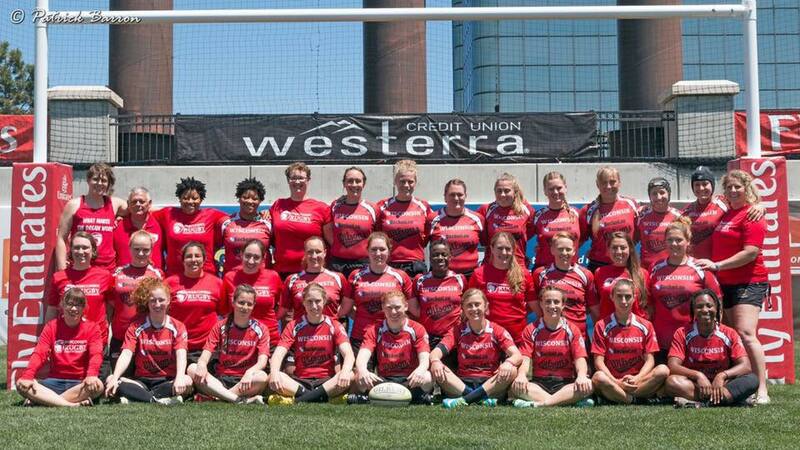 2015-2016 USA Rugby National Final – Official Team Photo for Wisconsin Women’s Rugby Football Club. Saturday, June 4, 2016. Photo taken by Patrick Barron.